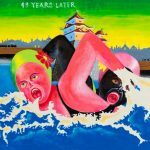 Known for his distinctive poster designs, the veteran Japanese artist Tadanori Yokoo is earning belated attention overseas for his work as a painter, too. 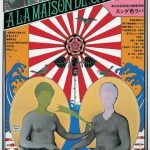 Tadanori Yokoo, Chinsetsu Yumihari-zuki, 1969, silkscreen on paper, 40.75 x 28.94 inches. 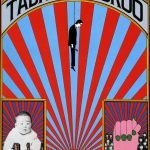 The Tokyo-based graphic designer and painter Tadanori Yokoo is regarded as one of the most accomplished doyens of modern art in Japan, even if, for all his renown, the scope and diversity of his oeuvre are still not very well known in the West. However, Yokoo’s work in the field of poster design, for which he won acclaim earlier in his long career, still boasts a cult following among design mavens and specialists around the world. Meanwhile, in recent decades the artist has devoted his energy primarily to painting, a development that may have confounded Yokoo-watchers both inside and outside Japan who thought they had his work neatly pegged and placed somewhere in the Eastern division of modern art’s complex, global history. 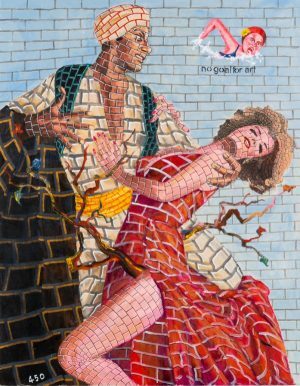 In fact, as the artist’s most recent series of paintings, which New York’s Albertz Benda Gallery has been showcasing over the past several years, have demonstrated, Yokoo is not only an artist whose moves are unpredictable but also one who mines his own life’s history for thematic reference points in enigmatic ways. Yokoo was born in 1936 in Nishiwaki, a town with a long history as a textile-producing center in Hyõgo Prefecture, in the southwestern part of Honshu, the main island in the Japanese archipelago. He was brought up by elderly adoptive parents who had run a kimono-fabric company. He grew up at a time when Japan was militarizing and then during the years of World War II in the Pacific. In the decades leading up to the right-wing militarist takeover of the government and the outbreak of war, Japanese art, culture, fashion, and intellectual life had been influenced by waves of incoming Western styles and democratic ideas. In his novels and essays, the contemporary writer Junichirõ Tanizaki identified the sense of nostalgia mixed with anxiety that his people and their tradition-embracing society felt in the face of modernity’s seemingly unstoppable approach. Even as a child, Yokoo loved to draw. After finishing high school, he went to work at a printing company, then at a newspaper in the port city of Kobe. He soaked up the colors, textures, and ambience of the fading world in which he had grown up and, after moving to Tokyo in 1960, worked for an advertising agency and then as a graphic designer at Nippon Design Center. That company was run by Ikko Tanaka, an innovator who profoundly influenced modern graphic design in Japan. At the time, the Japanese capital was undergoing rapid reconstruction, as war-devastated neighborhoods of old wooden structures and cozy back streets gave way to high-rise concrete apartment blocks and commercial centers. Yokoo fell in with underground avant-garde artists, including Tatsumi Hijikata, the creator of the psychologically intense butõ dance form, and Shuji Terayama, a poet, dramatist and filmmaker. Yokoo began creating collage-like posters to promote their performances and events. In developing such projects—and, through them, a signature look and aesthetic that imitated no known style—Yokoo, who as a child had enjoyed classic warrior tales, evoked the look and character of such indigenous, pre-modern source material as printed menko game cards, with their images of samurai, movie stars, or famous athletes; old kimono-fabric labels; Hokusai-style waves; antique typography; and the Hinomaru, Japan’s traditional Rising Sun flag, with its bold rays extending out from a red disc. Breaking with the uncluttered approach to modernist design that prevailed in cutting-edge poster, book, and advertising design in Japan in the 1960s (and which typified Tanaka’s own spare, elegant style), Yokoo packed his poster designs with allusions to a pre-modern past, but with all the verve and some of the irony of the emerging Pop Art style. A few years ago, in an interview published in a newspaper in Japan, Yokoo recalled that his work “constituted quite a critique of design as it existed” at that time. Eventually, professionally, he set out on his own. He became friendly with well-known sports stars and performers, his own celebrity rising in tandem with the power and influence of postwar mass media. In 1966, Yokoo presented his first solo exhibition at a Tokyo gallery, and as his unusual work became known overseas, foreign critics were quick to tag it “Pop Art.” In 1968, he designed a poster for the “Word and Image” survey of poster art at the Museum of Modern Art in New York. It featured Hinomaru-style sun rays shooting out from a giant eyeball. Four years later, MoMA mounted a solo exhibition of Yokoo’s work, consolidating his stature at home and abroad. Since that time, outside Japan Yokoo has often been called a Pop artist, referred to as a Japanese counterpart to such iconic American artists of the 1960s as Andy Warhol or Peter Max. However, in Yokoo’s case, that label has never been completely accurate. 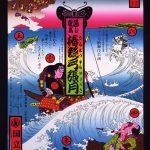 Certainly American pop-cultural influences could be strongly felt in Japan after the war years, but for all their bold color and impact, thematically, Yokoo’s posters looked back, not ahead to some fantasy of a high-tech future, nor did they celebrate the emerging postwar consumer culture. (One of his most famous posters mockingly announced the artist’s own death at the age of 29.) At the same time, Yokoo carefully balanced the emotional temperature of the potentially nostalgia-provoking elements of his poster designs in a way that prevented them from becoming kitsch. Even as he produced a vast body of work and developed friendships with such leading cultural figures as the fashion designer Issey Miyake (for whom he has routinely created runway-show invitations for many decades) or the writer Yukio Mishima (a nationalist who famously committed ritual suicide after a failed coup d’état attempt in 1970), there were periods in his career during which he made paintings. And in 1981, after visiting a Picasso exhibition at MoMA, Yokoo declared that he had given up graphic design in order to devote himself to painting. 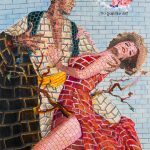 “When I entered that exhibition, I was a graphic designer and when I left I was a painter,” he recalled many years later. In fact, Yokoo told Art & Antiques in a recent written interview, “I started creating my first paintings in 1966. My motifs in those early works were young girls in seductive poses in various situations.” He made about 20 such pictures in acrylic on canvas, including some depicting women with pink-red skin and bathing caps swimming in a moat surrounding a medieval Japanese castle. Yokoo did not exhibit those paintings outside Japan around that time. Instead, as he grew his hair long, savored the Beatles’ music, assimilated the hippie and psychedelic trends of the 1960s and early ’70s, and traveled to India, it was his distinctive posters that attracted the attention of fans and collectors. In that pre-Internet age, such ideas reached Japanese artists mainly through art magazines. Whether or not Yokoo was directly influenced by the “bad” painting trend, when he first started exhibiting his pictures in Japan, some critics and viewers did not know what to make of his big career turn. Animals, starbursts, ectoplasmic garlands of color, dramatically lit figures like characters in movie posters, old buildings, assorted motifs from traditional Japanese art, whole panels of abstract patterns, and fragments of words written in Japanese or in Roman letters—Yokoo’s compositions could accommodate just about anything. Sometimes, in an atmospheric manner, they suggested recognizable narratives but mostly their intended meanings, if any, were anybody’s guess. Yokoo explained that, as he has continued to revisit and rework some of his earlier pictures, the process “has developed into something like conceptual art.” As it turns out, it was only last year, in the “International Pop” exhibition that opened at the Walker Art Center in Minneapolis and was more recently presented at the Philadelphia Museum of Art, that Yokoo’s “Pink Girls” from the mid-’60s were first shown in the U.S. “I wonder what would have happened if these works had been shown in the U.S. in 1966,” he said.